The shimmering turquoise waters and lost worlds of the Aegean await you. Grab your travel hat and join us for a unique cultural journey to the dramatic landscapes of Greece and Turkey - to dazzling ancient cities, majestic empires, and magical treasures of history. 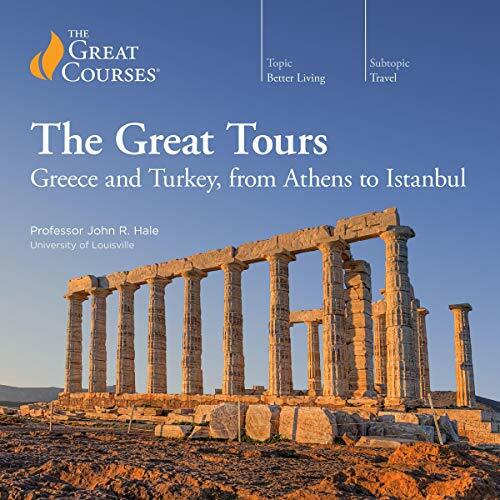 In The Great Tours: Greece and Turkey, from Athens to Istanbul, award-winning Professor John R. Hale of the University of Louisville is your guide to the fabulous civilizations of the Greeks, Romans, Byzantines, and Ottomans, and to the natural wonders and idyllic landscapes that surround them. These 24 richly enjoyable lectures give you the chance to experience these important sites and cultures through the eyes of an expert archaeologist and scholar, whose knowledge and depth of insight go far beyond any ordinary travel narrative. In each site, you explore the critical history and culture that defined it and the ways in which it influenced our modern world. These lectures offer both a rich resource for travelers preparing to visit these distant lands and a multilevel cultural journey that can be enjoyed just as well from the comfort of home.